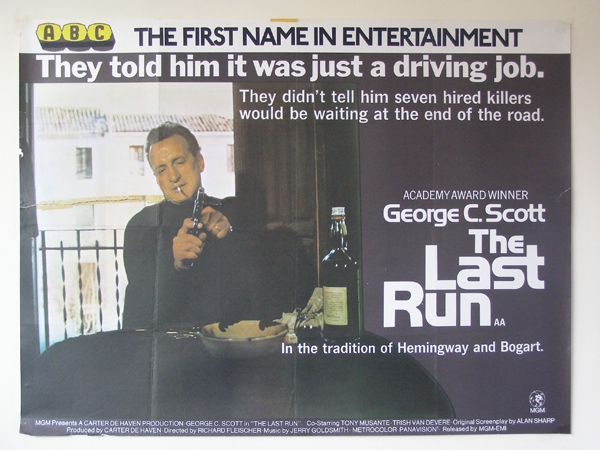 The Last Run is a neo noir film from 1971. It stars George C. Scott a year after his Academy Award Winning performance in Patton. When asked why he made this movie he said “I’m doing it because it reminds me of old Bogart pictures.” This film originally started out being directed by the man who made Bogart famous, John Huston. After constant fighting with Scott, Huston quite the film. Richard Fleischer took over as director and the films original leading lady was fired and Trish Van Devere replaced her. Interestingly Scott’s wife at the time Colleen Dewhurst had a small role in this film. Her and Scott’s marriage was pretty much over by this time. Scott would go on to marry his new co-star Devere a year later. Scott plays a retired mob driver, who takes a job after his wife has left him. We are left in the dark on what this job is, but we know he needs to drive across the border into France. Soon there is a daring escape when a wrecked truck explodes and a prisoner runs to Scott’s 1957 BMW convertible. This escaped prisoner is played by Tony Musante. Musante demands a detour from their intended path to pick up his girlfriend played by Devere. When Scott delivers the couple to his employers, Musante tips Scott off that something is wrong. Scott rescues the couple from sure death and our trio’s adventure begins. We learn a little more about our trio’s history and a love triangle of sorts begins. Will our three make a clean escape? Who will our girl choice? This film bombed at the box office and was not well received at the time by critics. Not sure why, maybe critics and audiences were looking for something different from the current Academy Award winner. I enjoyed this film for what it is, a simple neo noir with some good performances, an interesting, mysterious plot, and some great car chases. If you are a fan of Scott or other neo noir film of the early 1970’s I think you will enjoy this film.